The last of the painting I need for Historicon. 10 Renegade Celts. awesome, I particularly like the red bridles on the horses..a nice touch. 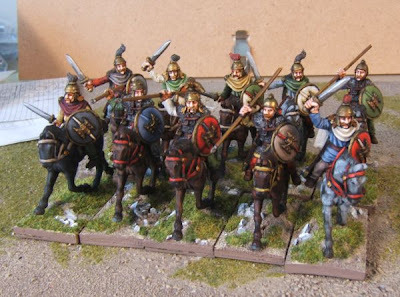 The Regiment comes with two packs of Celt cav, and one pack of Celt Noble cav, below. I'm not impressed by the boatload of plastic celts I know have and am trying to figure out how I can salvage the army..I may move to all metal figs..they just look so much better-- I need to check the scales on Foundry and Renegade ..if they match up...I'll probably do it. I just sent you an email about the figures.